Greetings Citizens of the Empire, as chief public relations officer I greet you in the name of the Emperor and pass his best wishes to you on this special day. 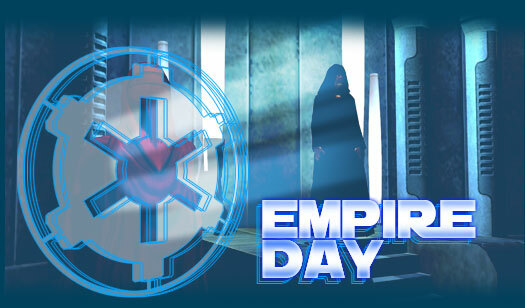 Each year since the Galactic Senate in its infinite wisdom entrusted the government of the galaxy to the impeccable guidance of the Emperor Palpatine, Empire day has been a cause for Celebration. Not only does it celebrate the unification and rise to power of the Empire, but also the abolition of the corrupt Jedi Council. We encourage you to join the others all across the galaxy celebrating this special Day. You can join those on the pilgrimages to various locations throughout the galaxy and maybe even find precious mementos of the occasion. Fear not any rebellion disturbances as they will surely be put down quickly by the might and justice of the Imperial Army. ######Transmission Restored-- -- and we are sure you will have a great and glorious time at any of the fireworks displays sure to be held on many worlds. Long Live the Empire and Goodnight! A day of celebration or a day of infamy? Opinions differ greatly on the merits of Empire Day, but one thing is true: Empire Day is the day marking the Emperor's rise to power and the termination of the Jedi Council. Despite the efforts of the Rebellion, Empire Day is widely celebrated throughout Imperial controlled space due to the massive public relations campaign that drives it each year. Subsequently, few beings do not know about it. The actual "day" of this holiday is marked according to Imperial Center time, but celebrations can last days or weeks depending on culture and location. Due to the vast and varied worlds controlled by the Empire, beings on many worlds celebrate in different ways. Some make pilgrimages to the " Imperial Center ", also known as Coruscant, to be near where the fateful actions took place. Some just wish to be near the Emperor himself, though they don't expect to see him. Others take on charity work to show support for the sacrifices made by the Emperor throughout the clone wars and the Jedi rebellion. Others simply gather with friends and kin and have private celebrations or other contests, marking the day with festivities and fun. Those who oppose the Empire see the day as the turning point in a long campaign of duplicity. These beings mark the day with protests, counter-propaganda efforts and, sometimes, outright attacks on Imperial facilities. Fighting the massive propaganda machine of the Empire is a daunting task, but each gain is a step closer to success. Each year the Rebellion works hard to fight the tide of Imperial public relations in the hopes of turning loyal Imperial citizens to their side of the galactic civil war. Showing the gap between the propaganda and the Rebellion's vision of the truth is often a good way to accomplish that goal. Even if it was not a mandated galactic holiday, many would still mark its passage because of the great changes it created. The Senate gave up the majority of their powers. The Jedi Council was destroyed. The Emperor took full control of an entire galaxy. Everything changed. For good or for ill is open to debate, but it is definitely a day to be remembered. Beginning around June 28th, both the Empire and the Rebellion will have dispatched public relations officers to answer questions and to promote their faction's vision of the holiday. If you are Imperial or Neutral, you can find the Imperial Public Relations Officer at Nashal, Talus at waypoint 4311, 5187. He'll be happy to tell you more. If you lean more towards the Rebellion, or are Neutral, you can shuttle to the Cantina in Anchorhead. Ask around until you find someone willing to tell you the truth of this fateful day. Whichever path you choose, a small adventure will follow. While no combat is required, you may have to travel to some dangerous places, but if you travel cautiously you should be alright. See it to the end and you will receive a token of appreciation for your services. If you pay attention and play your cards correctly and you might be able to acquire two mementos. These faction "spokesbeings" will appear in Nashal and Anchorhead with the launch of publish 19 (around June 28th ) and remain until July 11 th to give everyone a chance to participate. We hope everyone has a productive Empire Day...whichever side you choose to support.